Signature image for ‘dai marciapiedi italiani’ (from Italian footpaths). Full exhibition shown at Gallery 101 Melbourne 31 Oct – 25 Nov 2006. Selected works shown at Gallery 25 Mildura 21 July – 31 August 2006 – opened by Stefano de Pieri & part of Mildura Writers festival. 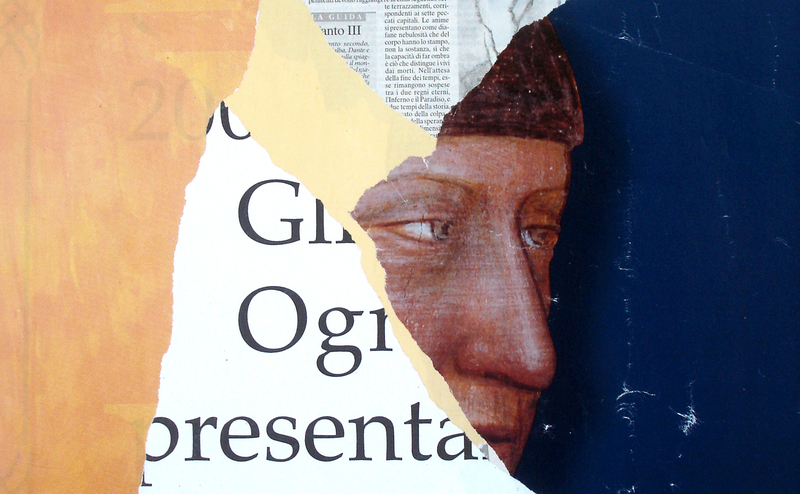 ‘dai marciapiedi italiani’ is an interplay between collected images and text from various sources. The text is used generally in an abstracted, graphic manner, but this is counterpoint to a subtle rendering of detailed snippets of stories and reports from newspapers, magazines and other sources, such as the historical Medici diaries from Florence. Street surfaces and outlet covers, collected through rubbings or frottage, not only provide graphic evidence of industrial histories, but also document the physicality of walking. Meaning is often ambiguous with the seemingly random layering and juxtaposition of compositional elements allowing for a range of interpretations. The works could also be viewed as time capsules, incorporating as they do all manner of information about life in these Italian cities: from Vivaldi and musical events to Dante and Petrarch; from electoral information to restaurant and Vespa advertisements.